The Scorpion racer is a unique and playful design ideal for introducing some fun in to your child’s bedroom. Dont be fooled by the shapely design this bed fits a standard UK single mattress (90x190cm). A mattress is not included and needs to be purchased separately. Finished in hot red with superb detailing, wheels and spoiler included, the Scorpion racer will bring life to the most plain of bedrooms. 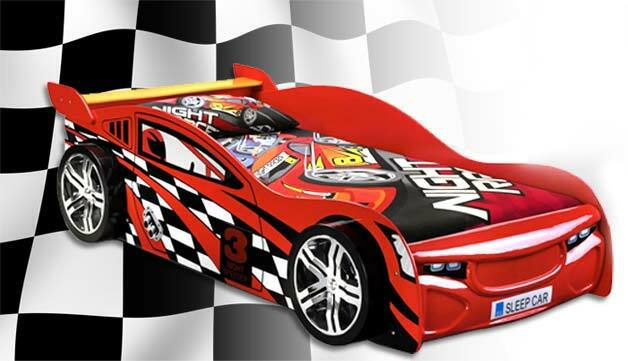 Let your little ones be the envy of all their friends when they tell them they go to sleep at night in their very own race car! Made from a strong wood combination for a sturdy, durable construction. Finished with a vibrant hot red and quality painted detailing. The front of the car has been finished with high gloss to create the sleek look of the Scorpion racer. Complete with a supportive slat bed base. Maintenance is simple, wipe over with a damp cloth to keep a dust free finish, avoid harsh household cleaners. When moving the bed always lift rather than dragging or pushing, to avoid incurring accidental damage to the joints. The Scorpion racer bed will be delivered flat-packed and self-assembly is required. We would recommend two people for a safe and quicker assembly process. Take a look at the assembly instructions for yourself.